Construction of King-king is expected to commence in 2015, with production starting in 2016-2017. On average, the mine will be producing 138 million pounds of copper, 236,169 ounces gold and 506,504 ounces of silver annually.The King-king tenement is comprised of 184 mining claims that are owned by Nationwide Development Corporation (NADECOR) under Mineral Production Sharing Agreement #009-92-XI (the MPSA), approved by the Government of the Philippines on May 27, 1992, and amended December 11, 2002.The MPSA grants NADECOR the exclusive right to explore, develop and exploit minerals within the area comprising the King-king deposit.The project is listed as one of the top priority projects by the Philippine Mines and Geosciences Bureau and it is a gold-rich porphyry copper deposit spatially related to significant epithermal vein systems that can be potentially exploited by open pit mining methods to produce economic concentrations of gold and copper. 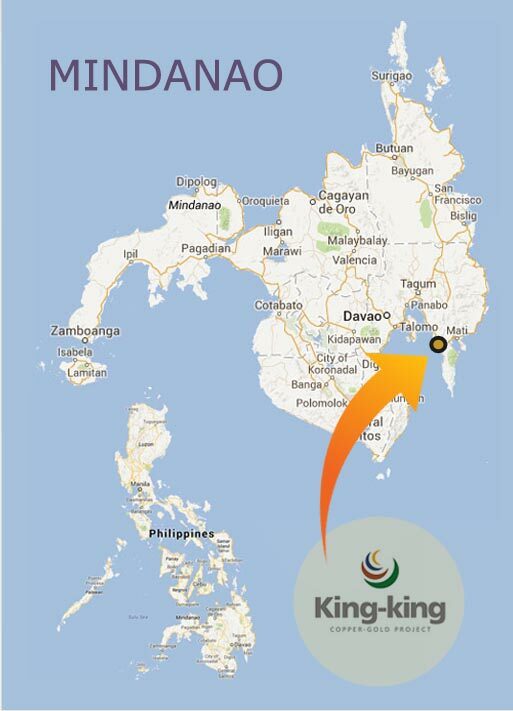 King-king’s mineral reserve amounts to 617.9M tonnes at 0.300% total copper and 0.395 g/t gold. Copyright © 2013 St. Augustine Gold & Copper Ltd.